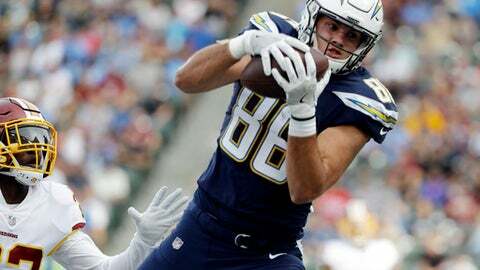 A collective groan howled across the fantasy football world upon news of Chargers tight end Hunter Henry’s torn knee ligament on the first day of organized team activities. Henry had become the cool kid in the tight end class as the departure of Antonio Gates opened the door for Henry to emerge as a top 5 TE with the upside to rival New England’s Rob Gronkowski, Travis Kelce of the Chiefs and Philadelphia’s Zach Ertz. The loss of Henry will enhance the value of the top 3 at a position ripe with uncertainty. Younger players like Evan Engram (Giants), players in new locations like Jimmy Graham (Packers), Trey Burton (Bears) and those with the opportunity to rise (Rico Gathers replacing Jason Witten with the Cowboys) are all mixed up into a pot that will cook up a tight end that will become a weekly must-start asset as the season moves on. Once the top 3 TEs are off the board by the end of the fourth round, there’s no need to push the panic button if you missed out. Continue building your depth at running back and wide receiver through the 12th round, at which point you should start looking at those who are in TE-friendly offenses. A good candidate for this theory would be George Kittle of the 49ers, who developed a solid rapport with quarterback Jimmy Garoppolo over the final three games of last season (11 receptions on 14 targets and a touchdown). San Francisco finished ninth in the league in passing yards and the addition of running back Jerick McKinnon will further boost the fantasy value of an offense that averaged 32.2 points per game in their four-game win streak to close out the 2017 campaign. Also add O.J. Howard to the fray. Howard played second fiddle to Cameron Brate during his rookie season but the first round pick of the Buccaneers scored six touchdowns and averaged 16.6 yards per catch on his 39 targets. It’s not a stretch to envision Howard’s floor being 60-65 targets which could translate into 7-9 touchdowns in a pass-first offense in Tampa Bay. Diamondbacks first baseman Paul Goldschmidt is the front runner for valedictorian in the class of 2018 fantasy baseball busts. Entering Wednesday, Goldschmidt was hitting just .198 with five homers, 13 RBIs and two steals, numbers that are way off the pace of a player who was drafted in the top 6 overall of most drafts. He’s currently in the midst of a miserable May that has seen him hit .096 in 73 at-bats. Now is the time to call up the frustrated Goldschmidt owner in your league and pry him loose. If you’ve got a player with sell-high value, make him the centerpiece of a deal that could net you Goldschmidt, who’s way too good to remain in the lower dregs of production. Denny Hamlin ($11,200 at FanDuel, $7,600 at DraftKings) has yet to see the checkered flag this season but that changes during Sunday night’s Monster Energy NASCAR Cup Series at Charlotte. Hamiln has been solid at Charlotte Motor Speedway, finishing in the top 5 five in four of his last five races in the Queen City. With five top 5s and seven top 10 finishes this season, Hamlin looks like a strong threat to snap Kevin Harvick’s seemingly iron grip on the winner’s circle in the early portion of the 2018 campaign.